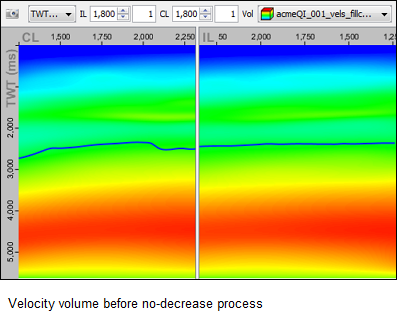 Description Process a velocity volume to remove decreasing values as time/depth increases. 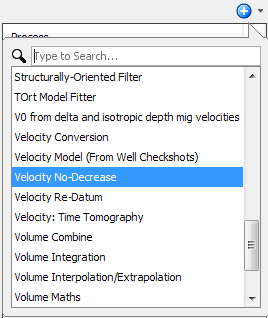 Velocity No-Decrease removes decreasing velocity values from a velocity model as the time/depth increases. A horizon can be specified as a shallow bound for the correction. If no horizon is defined, the process will be applied to the entire velocity volume. Tip: If you have a velocity volume of another class, you should first convert the velocity volume to interval velocity using the Velocity Conversion process (see Velocity Conversion). Once done, you can use the converted velocity in the Velocity No-Decrease process. 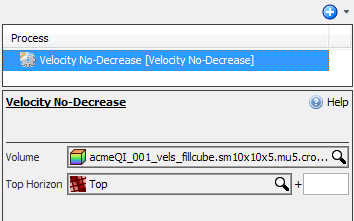 In the Details Panel, select a Volume of the class "Velocity (Interval)" or "Velocity (RMS)" to be used in the process. To convert between velocity types, use a Volume Conversion process. Select a constant value or a horizon at Top Horizon to process the velocity volume below. If a horizon has been selected, a constant value can be inserted to offset the horizon. If not provided, the entire velocity will be processed. As a result of this process, a new volume of the same class is available in the Volume tab. 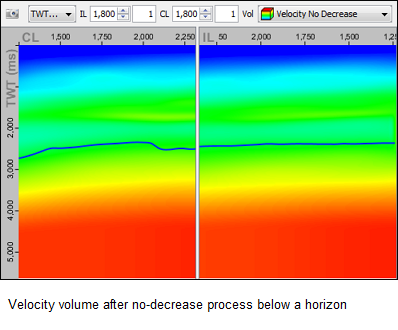 The following examples show a velocity volume before and after the Velocity No-Decrease process is applied below a horizon.